Skillys Big Chip Lodge. Prime waterfront. Relax, fish, quality time, enjoy! This is PRIME waterfront! The best view. 50 feet from your boat.. You won't find authentic Northwoods charm and history like this ANYWHERE! RELAX! Historical photos inlaid in the bar are incredible. Canoe, kayak, ski, tube, swim, fish. Skillys Big Chip Lodge(Facebook) is the size of two cabins and right on the lake. Incredible view plus your own bar. WIFI & TV. New air upstairs as of May 2018! On Moore’s Bay of the Chippewa Flowage(Home of the World Record Musky). Check out the incredible Fall rates. Musky and crappie go wild in Moore's Bay! Waves lap the shore while the smell of brats fills the air. Cook out on the huge deck and chill with a cool drink or local Leinenkugel beer inside at an “old days” photo filled 15 seat bar with stereo system overlooking Big Chip. Float around and just relax in the summer. Plenty of space for guests with 2 half baths downstairs and one full bath with shower tub upstairs. Right on the ATV and snowmobile trails. Incredible hospitality is found going from Lodge to Lodge by snowmobile. Deerfoot Lodge is 5 blocks away just the first of dozens! Have meals at the bar looking out over the legendary wilderness lake Chippewa Flowage. Million dollar view of Chippewa Flowage(Home of the World Record Musky) from what used to be a bar! Moore's Bay fills with nice crappie in the Fall. Trophy musky, walleye, smallmouth bass, largemouth bass, northern, perch and bluegill abound. Snowmobile. Ice fish. Deer and grouse hunt across the bay in the Chequemagon National Forest. Cross country ski. The American Birkebeiner is held in February starting in Cable and ending in Hayward. 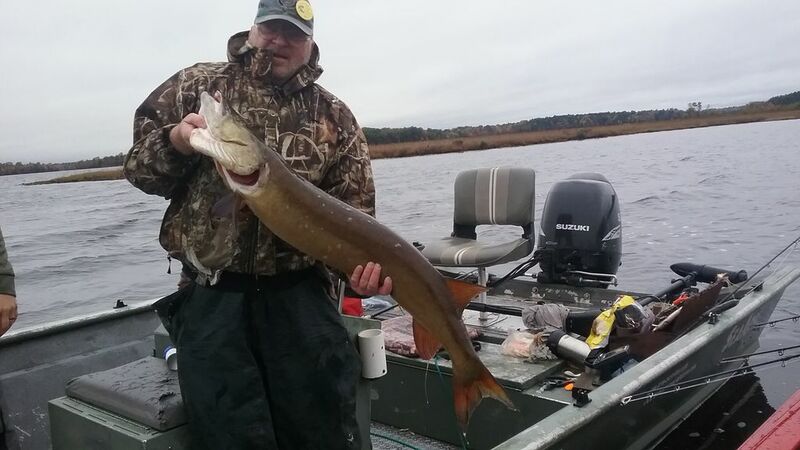 Groups can musky fish and deer hunt in the Fall. Hayward Lakes Muskies Inc. Tournament is the first weekend in October. Moore's Bay fills with crappie in the Fall. Photo filled bar overlooks huge Big Chip and the private dock. 3 knotty pine bedrooms upstairs and open room with bed and couches downstairs sleeps up to 12. Check out the walk thru video. Satellite 50" TV. Huge kitchen with 2 refrigerators and a full size freezer. Catch fish off the dock. Float around on a warm summer day. Relax with a beverage under millions of stars by a lakeview campfire with your friends. Smell that food grilling out on the huge deck. You can't get any more comfy and laid back than this. Come on out to the country. Book NOW to get your dates reserved! Check for boat rentals. Also Deerfoot , Johnson's , Deer Run or Dun Rovin . I moved to Cabin One next door to the Lodge in 2016. I've had a varied life as a commercial illustrator, childcare center owner, commercial fisherman, beverage salesman, small business entrepreneur and insurance man. I recently earned my insurance license and work as an independent agent with Hayward Insurance. I'm also the father of four beautiful children and 7 and 3 year old granddaughters. And in the picture is my very special girlfriend, Mame. This property has the best view and the most desirable access to great fishing, skiing and hunting on Big Chip! Total wilderness across the lake and South. NO houses. You'll think you're in Canada. The Chequemagon National Forest will stay like this forever. Plus it's right on the snowmobile and ATV trails and fabulous ice fishing location. The American Birkebeiner is a blast! Think of the fun your group will save by having your own bar! A huge deck, knotty pine construction, beautiful fireplace room, dock and great view make this place. Then there's the historic bar filled with pictures of days gone by. Think of the money your group will save by having your own bar! Relax without feeling like you're on pins and needles around the furnishings. I still see something new there as I eat my breakfast and look out over Big Chip. Awesome. Moore's Bay fills with crappie, walleye and musky in the Fall. Everyone on the lake comes right out front of the Lodge for excellent fishing every Fall. There's water skiing, ice fishing, cross country skiing and snowmobiling just out front. Then there's the American Birkebeiner Ski Race in February. Always something going on here. Upstairs full bath with tub/shower and toilet and sink. Downstairs two bathrooms each with a toilet and sink. Downtown Hayward is full of quaint shops and also has the Fishing Museum The American Birkebeiner finish line is in Hayward. Docks and swimming with floats 50 feet from deck. 50 feet from Moore's Bay, Chippewa Flowage. Lodge dock capable of two or more boats and electricity. Campfire ring and millions of stars await. Incredible view from huge deck and lakefront windows. Cross country ski or snowmobile across the frozen lake in Winter. The #6 snowmobile trail goes right by in front. The American Birkebeiner is held nearby in Hayward. It starts to the north in Cable. Hayward was just voted Number One destination for cross country skiing. Cookout on the deck overlooking Big Chip! 50 feet and walleyes, smallmouth off the dock. Moore's Bay fills with crappie, walleye and musky in the Fall. Right on snowmobile trail. Cross country ski from here also. Ice fishing straight out. Summer 2018 we plan to install one upstairs window air conditioner. We get very few warm days but guests have asked for this. Extra set of clean sheets in bottom drawers of each bedroom. More blankets, comforters, etc are in Master Bedroom closet. Towels ARE NOT provided. Please bring your own. Lots of glasses, dishes and utensils. Large kitchen and pantry with lots of pots, pans, containers and utensils. Dish towels also. Bring dish soap & paper towels. More if you use the entire bar! Great stereo system with AM/FM radio. Rock on! Excellent radio stations come in including GMO 95.3 and the Indian station at 91.5. Many others. Firepit (bring firewood) for campfires overlooking the lake and stars. Canoe rentals at the Hayward KOA for a great river trip. Big Chip canoe free. Huge deck overlooking the lake. For pontoon and fishing boat rentals call Deerfoot , Johnson's , Deer Run or Dun Rovin . Right on the snowmobile trail and excellent starting point for cross country skiers. Large parking area for a few cars/trailers. Also fish cleaning house. I put my 18 ft boat in at Deerfoot or Deer Run Resorts nearby. The have more water for bigger boats than our boat launch. They charge $5 total for in and out. Leave money in box at ramp. Great place with a lot of History too! It was great to have you and I was especially happy that you guys had the proper gear for the brutal temps. See you again! Classic lodge setting with a personal bar. Plan on returning next year! Thanks so much! See you then. Thanks Curt and crew. And, thanks for the T-shirt. It was great hanging and having dinner with you guys. Hope to see you next year! Vintage rustic lodge that owner is fixing and saving. Nice space for a group if you all want to be in one place. The Chippewa Flowage is amazing and right out the back door / deck. Many boat rentals in area. Just a note, boats take gas. We ran out, silly suburbanites. Hayward a short ride away. Gary’s a nice guy and we wish him well on the renovations. The building has history and deserves to be saved!! We had a great week!!! Thanks so much for visiting.Yes, year after year the place gets improved. Plenty left to do but I appreciate guests that understand money makes fixes happen. Bring more gas and come back and see the beauty of Big Chip! I contacted Gary before booking telling him I was bringing my wife, 4 children and my parents to the "lodge". My mother is recovering from breast cancer and I wanted to ensure she would be comfortable. I was absolutely shocked when we arrived and I saw what I had just paid for. The place is filthy, simply disgusting. It is in need of major work and cleaning. My mother refused to even sit in the place and slept in her car the first night, it broke my heart to put her through that. We had to spend our vacation time cleaning and scrubbing to make it the least bit useable. We had to buy new linens to try a make my mother somewhat comfortable. hope nobody has to pay this kind of money for this kind of experience again. Please do your research, ask the neighboring resorts etc if you think I am just ranting.. you can do a WHOLE lot better for the money you will spend on this filthy rental property. First of all, please read the other reviews also and watch the walkthru video. Although there may have been a dead fly on a bed there has never been any bed bugs reported as insinuated in Patrick's great story. The sheets had been replaced that very morning with clean sheets fresh from the laundromat. I have since replaced a shower surround that had been cracked by a client. Tape gone, beautiful new clean surround with new linoleum floor also. I have an old bar here that is not perfect in any way. It is well worn, comfy and definitely not perfect. I'm constantly making improvements which cost money. The price is right for the number of people and pets accommodated and it's location. Never was there any dirt or mold in the old shower. The cleaning lady takes great pride in her work. She would LOVE to have a talk with Patrick . I hope Pat can find a place to swim, fish and enjoy the outdoors with his pets, spouse, parents and especially his children. PS...This is exactly why I post a walkthru video on my site to show potential clients what they are renting. One of a kind place with a great story. Can’t beat having access to docks right on the water. We will book again! Thank you so much. I was so lucky to end up with this historic spot. Take care and see you again. Just out of Hayward past LCO Casino and the new Prop's Landing, Big Chip Lodge is on the edge of the Chequemagon National Forest. Wilderness beauty is spectacular with the sounds of loons and zillions of stars in the dark night sky. Right on the ATV and snowmobile trails. Big Chip Lodge is waiting for fun travelers! Moore's Bay fills with crappie in the Fall. The Hayward Lakes Muskie Inc. Tourney, Lumberjack Shows and American Birkebeiner are here. Cross country ski across this huge lake. Ice fishing straight out in Moore's Bay. Snowmobile Trail #6 out front. Sawyer County Airport 2 miles For pontoon and fishing boat rentals call Deerfoot , Johnson's , Deer Run or Dun Rovin .